Besides wanting to be a type designer, I also want to be a hand-letterer. So, I have experimented by drawing a Copperplate-esque script. This is sort of new terrain, so when giving your constructive critiques, I would appreciate if you would elaborate on why you think what you think. I usually use the Yanone plug-in in Glyphs to smooth out my curves. I haven’t done that this time. I would also greatly appreciate if you could give me tips on how to vectorise scripts more effectively. ‘Bog’ means ‘book’ in Danish. Thanks! I don't usually weigh in on critiques, but one really basic misstep here is, the thickness of the curved strokes (on the o and g especially) should be thicker at their thickest point than the straight-ish strokes. This would also be true on the top bowl of the B, but maybe to a lesser extent. Thanks. Yeah, I agree with you on that. 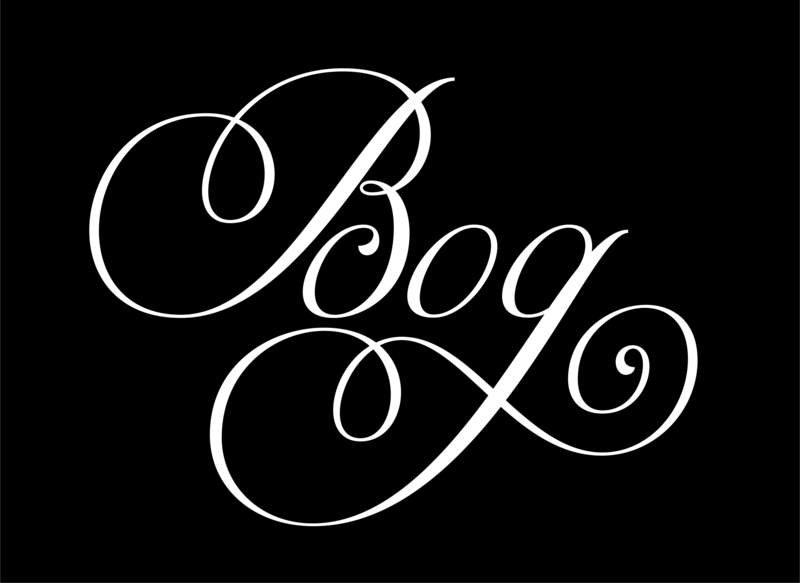 The length of the descender in g, and its lack of curvature until it gets very low, made me read this as Boq at first. Personally, in a fancy lettering like this, I would opt for a binocular g. I would also move the o to the right to optically center it between B and g. Lastly, I'm not sure whether this is a problem (probably not, actually), but the swashes are not nearly as cursive as the letters. Thanks! Lol, yes, I forgot to center the O. I understand why you feel the swashes are not as cursive. I used centre-alignment when I designed those. First learn the style with a pen and paper, that will make the fakery more convincing. »[…] how the thicks and thins are distributed in spencerian […]«. I guess the reason for it not coming across in my lettering is I didn’t respect the 55° angle when I drew the thicks? I used a 90° angle if that makes sense. When you mess around with negative space, it directly affects the positive space too. So in a way given the current stress angle and the axis for o/g, the stem on g and B are sort of fighting it given it's at a completely different angle. Also I think the sizing of the lettering exacerbated the issue, maybe at smaller sizes it may not be that obvious. I'd first sort that out optically and less numerically so they appear in a similar angle to look cohesive. I drew up an example [link] to see how you have to maintain the same stress/axis across the board. 1. is based on your current angle using o/g as a reference but I applied that to B/g so you see can see how they should be weighted, 2. is the conventional way of doing it in calligraphy, in both examples it complies with how a pointed pen addresses weight. You can break this rule and go about however you please like in your current iteration but if you do that you need to maintain that across the board. WRT to the contrast, I think most of the problem lies in how it's non uniformly weighted. bowls for o and g appear a lot thinner. B is somewhat okay but the top bowl could use more weight but since B is so heavy with flourishes, you'l have to see where it makes sense to tone down the weight. Also when it comes to flourishing you do not want thick strokes to go over thick strokes, it makes it look heavy like that you see on the upper bowl of the B. You generally want thick against thin when they crossover. In the case of the B's top bowl, it's thick going over thick, to resolve that you might have to push the bowl more to the right to thin it out at the intersection or you may have to thin out the B's stem before it reaches the top. Thank you. But I still feel the common theme is there is not consistency in the angle of the letters. Ramiro, just a heads up, the example you shared is copperplate, not Spencerian. Platt Spencer used copperplate as a jumping off point to create his variation. Sorry I am late to the party. @Michael Clark Yes, I am aware the style is not Spencerian, BUT it's an American custom to also call this kind of script lettering 'Spencerian'. Paul Shaw explained this to me in the past and Ken Barber (author of this lettering work) seems to be in line with his opinion too. I'm with @Michael Clark on this. Much of this confusion I think comes from some of the lettering legends like Tony Di Spigna and the whole Lubalin gang calling it spencerian. Being a huge fan of Tony Di Spigna's work, a lot of his work is actually part spencerian with a bit of italic hand throw in, even copperplate, so if the man wanted to call it spencerian, fine by me because it has elements borrowed from Spencerian. Ken and others I believe are merely borrowing the term to incorporate the same style of lettering. Ken B isn't new to this sort of thing obviously and he too is a huge fan of Tony's work or Forster's, Carnase, etc who all shared a similar style of script lettering. So that would explain why they call it that.